MOSCOW --- Russia’s Rosoboronexport company (a subsidiary of the Rostec state corporation) offers modern, reliable, and proven main battle tanks (MBT) to potential foreign customers. The company’s tank portfolio includes several types of the vehicles that meet all requirements to this type of defense hardware with the T-90MS tank being the most sophisticated one. The T-90MS MBT is designed to engage enemy’s tanks, self-propelled guns (SPG), and other armoured vehicles, as well as manpower. T-90MS is equipped with a new turret module that is fitted with an upgraded 125 mm gun and an up-to-date highly automatized digital fire control system. The fire control system allows detecting, recognizing, and eliminating of targets by day and night, on the move and at-halt using multichannel sighting systems of commander and gunner. The tank is armed with a guided missile system intended for elimination of armoured targets (including the ones protected by explosive reactive armour) at distances of up to 5 km. T-90MS has retained multilayered protection suite. The tank features low silhouette, low optical and infrared signatures, and automatized smoke screening system. 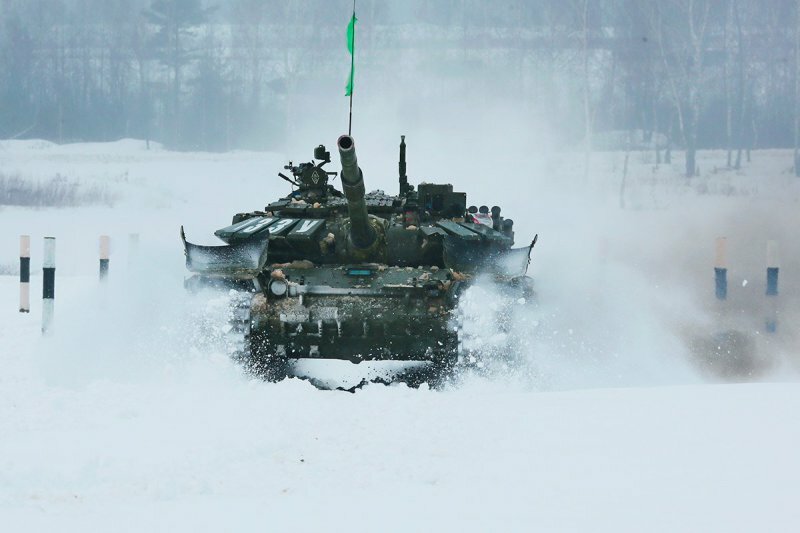 T-90MS is equipped with a new modular-type explosive reactive armour. A collective protection system provides the effective exploitation of the tank in the case of nuclear, biological, and chemical weapons usage by enemy. The T-90MS’ controllability and maneuverability have been enhanced through the medium of a more powerful engine, an automatic gear shifting control system, and a turnstile turning control system. Thus, T-90MS has reached the modern level of protection and survivability, having retained low silhouette, optimal weight, high maneuverability, and ability to cross the most complex obstacles hasty and at a high speed that are traditional for Russian-originated MBTs. According to the specifications of the T-90MS main battle tank in the official catalogue of the Rosoboronexport company, the vehicle has a combat weight of 48 (+ 3%) t (with ammunition), a crew of three servicemen, an average unsurfaced road speed of 35-40 km/h, a surfaced road speed of no more than 70 km/h, and a range of no less than 500 km (on surfaced roads). The MBT can cross a ditch of 2.6 m, a wall of 0.85 m, and a water obstacle of 1.2 m depth. T-90MS is armed with a 125 mm 2A46M-5 (2A46M-5-01) or 2A46M-6 smoothbore gun (an ammunition load of no less than 40 rounds) with an electromechanical autoloader, a 7.62 mm PKTM coaxial machinegun (an ammunition load of 2,000 cartridges), and a remote-controlled weapon station (RCWS) with a PKTM machinegun (an ammunition load of 800 cartridges) or a 12.7 mm weapon. Rosoboronexport also offers the T-90S, T-90SK, and T-72M1 main battle tanks to potential foreign customers. The T-90S MBT is a new-generation hi-tech vehicle based on the experience (including the combat one) of the Russian (as well as the world`s one) tank-building. The tank is a combat tracked vehicle that features powerful armament, an up-to-date fire control system, a reliable protection suite, and a high maneuverability. The main armament of the MBT comprises a 125mm enhanced precision smoothbore gun with an integrated zeroing-in system and a quick-releasable barrel. The gun features dual-axis stabilization and an autoloader. The usage of the auto-loading mechanism has increased the firing rate of T-90S to 7-8 rounds per minute that exceeds the performance of most part of its foreign counterparts. The ammunition load of the tank includes increased power rounds, namely, armour-piercing caliber reduced, high-explosive, and high-explosive anti-tank ones. The capabilities of the tank gun in the area of ground and low-flying aerial targets engagement have been improved, owing to the guided missile system: a laser beam-guided high-explosive anti-tank missile is loaded to the bore by the autoloader and fired through the barrel. The compact-mounted 12.7 mm remote controlled machinegun station allows commander to eliminate ground and aerial targets with high accuracy of fire. The tank features an automatized fire control system, through the medium of which the commander and the gunner can conduct firing from the gun, the coaxial machinegun, and the anti-aircraft heavy machinegun by day and night, on the move and at-halt. The T-90S MBT features an unmatched four-layered protection suite that includes low silhouette and square of front and side parts, an optoelectronic jamming station, combined armour, and explosive reactive armour. A powerful diesel engine and a reliable chassis, a mechanical transmission with hydraulic gears, a deep wading kit, and tracks with an ability to carry rubber track shoes provide high cross-country capability, maneuverability, and mobility of the tank. T-90S features an extremely high reliability. It is fitted with self-digging equipment and an attaching lug for mine plows. The vehicle can be carried by all types of transport. According to the specifications, the T-90S main battle tank has a combat weight of 46.5 (+ 2%) t, a crew of three servicemen, an average unsurfaced road speed of 35-40 km/h, a surfaced road speed of 60 km/h (maximum), a power-to-weight ratio of 21.5 h.p./t, and a range of 550 km (on surfaced roads). The MBT is armed with a 125mm smoothbore dual-axis stabilized 2A46M gun (an ammunition load of 42 rounds), a 7.62 mm coaxial machinegun (an ammunition load of 2,000 cartridges), and an anti-aircraft 12.7 mm heavy machinegun (an ammunition load of 300 cartridges). The guided missile system has a firing range of 100-5,000 m. The MBT can cross a ditch of 2.6-2.8 m, a wall of 0.85 m, and a water obstacle of 1.2 m depth. The T-90SK main battle tank is designed to provide unit control and communication with command posts and to act in unit formations. The tank is a variant of the T-90S MBT and features the R-168-100KBE high-frequency radio, the TNA-4-3 tank navigation system, and the PAB-2M azimuth circle. The basic specifications of the T-90SK MBT are similar to those of T-90S. The armament and protection suites, the powerpack, the transmission, the chassis, the observing systems, the deep wading kit, the self-digging equipment, and the attaching lug for mine plows of the command tank are equal to the ones of T-90S. According to the specifications, the T-90SK main battle tank has a combat weight of 46.5 (+ 2%) t, a crew of three servicemen, and a power-to-weight ratio of 21.5 h.p./t. The Rosoboronexport company also offers the T-72M1 MBT that has a huge number of advantages over the basic model. The T-72 tank features a low silhouette, a relatively low weight, a powerful armament, a high reliability, and low maintenance costs. As a result, the vehicle has been included in the list of the best world`s tanks. The upgraded T-72 MBT has retained the advantages of the basic model and received new items that provide its superiority over counterparts. The upgraded T-72’s firepower, protection, and maneuverability have been enhanced over the basic variant. It is equipped with updated and brand-new nodes and components that compare the tank favorably with its predecessors. The 2A46M enhanced accuracy dual-axis stabilized automatically loaded gun increases the range of effective firing. An up-to-date fire control system allows the commander and the gunner to hit target with a high degree of probability on the move and at-halt, by day and night, in low visibility conditions. The upgrade of the fire control system and the integration of the 2A46M gun drastically increase the target detection range and firing accuracy of the T-72’s armament suite. A high-precision guided missile system provides elimination of all types of ground and low-flying aerial targets at distances of up to 5,000 m.
The high camouflage performance, basic armour, integrated explosive reactive armour, and an automatized smoke screening system allow the tank to accomplish combat missions under dense fire. A collective protection system provides the effective exploitation of the tank in the case of nuclear, biological, and chemical weapons usage by enemy. A 1,000-h.p. engine, an advanced support roller dynamic travel, hydraulic shock absorbers of increased power intensity, torsion bars with enhanced level of operating stress increase the average speed of the tank. According to the specifications, the T-72M1 main battle tank has a combat weight of 46 t, a crew of three servicemen, a power-to-weight ratio of 21.7 h.p./t, a maximum road speed of 65 km/h, and a range of 550 km (on surfaced roads). The vehicle can cross a ditch of 2.6-2.8 m, a wall of 0.85 m, and a water obstacle of 1.2 m depth. The tank’s armament suite includes the 125 mm 2A46M smoothbore dual-axis stabilized gun, a 7.62 mm coaxial machinegun, a 12.7 mm anti-aircraft heavy machinegun, and a guided missile system. The Rosoboronexport company also offers the 3UBK20 Invar round armed with the 9M119M guided missile. The round is intended for the T-72B, T-80U, and T-90S MBTs. It is designed to eliminate modern tanks up-armoured with explosive reactive armour, small-size engineer installation-type targets, and low-flying low-speed aerial targets (or hovering helicopters). 3UBK20 is comprised of the 9M119M missile and a propellant. The 9M119M missile features a tandem high-explosive warhead. The laser beam-guided missile can effectively hit ground, surface, and aerial targets by day and night, in various climatic zones and terrains (including the mountainous and sandy ones, as well as coastal lands). According to the specifications, the 3UBK20 round has a minimum firing range of 100 m, a maximum firing range of 5,000 m, an average armour-piercing capability of 700 mm, an operating temperatures range between -50 C° and +50 C°, and a full weight of 24.3 kg.